The Cabiri’s Ghost Game VII: The Wild Hunt cast its spell on the Youngstown Cultural Arts Center on Saturday, October 26, 2013. The Cabiri, directed by John Murphy, is a local aerial dance company, that focuses on preserving the stories of ancient mythology through dance and aerial arts. Accompanied by musician Sataray, the dancers of The Cabiri were powerful, fluid, and ethereal in this latest collection of folklore. Set in foggy candlelight against hanging tree branches and suspended silks, The Wild Hunt opened with Le Sorcier. Choreographed by Ian Jagel and Derek Broussard, the piece instantly commanded attention as the dancers took the stage with sharp, audible breath and staccato movement. Broussard exhibited great control and mastery of the Cyr wheel, even when a female partner leapt onto his back. Le Sorcier was brief and emphatic, but it could have benefitted from additional transition between movement and characters. Charly McCreary and Erica Sherman choreographed and starred in Moss Maidens, a vibrant, verdant aerial work. McCreary and Sherman, along with Marissa Smith, wound in and out of their green silks with strength and agility, showcasing supple extension and vulnerability even when the three were not perfectly in sync. The male dancers were effective in their roles as hunters, creeping darkly through the audience and assailing the maidens, ending the aerial dance with an unexpected feeling of violation. Closing the first act were John Murphy, Sarah Brodsky, and McCreary in the iridescent Dance of the Leaves. McCreary and Brodsky executed complex aerial choreography around Murphy. All three dancers engaged the audience with their intensity and control, all the while maintaining the mischievous aspects of the fairies they portrayed. After a brief intermission, the second act resumed with two dancers suspended above the audience in The Account of Hans Buchman, which combined the lithe, sinewy aerial work of Smith and Sherman as hunters of the title character, played by Mike Stephan. In this piece more than others, the aerial work upstaged the narrative content. Perhaps the most theatrical work of the night was Dame Hulda, the tale of two lovers caught in the woods by a wronged husband. Kirra Steinbrueck brought immediate strength to her role with precise lines and profound accuracy, though her emotionality took some time to develop. Steinbrueck and her partner, Murphy, were ultimately stripped of their white garb and left red and roiling on the floor by a group of hunters. 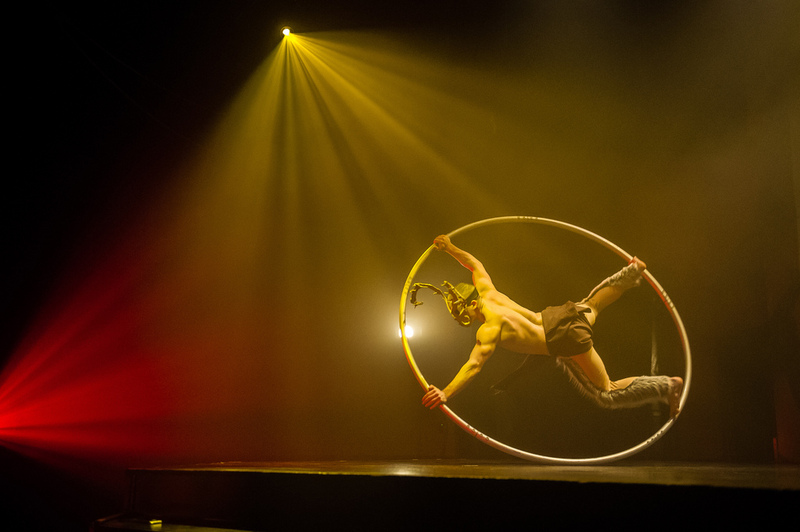 Striking images accompanied this moment, with Dame Hulda juggling orbs of red light, and a female hunter climbing the stairs and crossing the stage in a chilling backbend. The Wild Hunt came full circle with Hellequin, choreographed by Cyrus Khambatta and The Cabiri. The artists made full use of the space—from creeping through the audience, to suspending overhead, to climbing the stairs and filling the stage. With such impressive technical ability, the dancers also reached their emotional climax with this final piece, interacting expressively with one another and staring painfully into the eyes of audience members. Throughout the evening, Sataray remained stoic and composed as both the accompanist and narrator, from behind a candlelit table on the side of the stage. The musical score was consistently stirring and utterly complementary to the movement. There were times, however, when it lacked the dynamic shift of the dancers, who dripped from the ceiling, rolled across the stage, and took risky leaps and bounds in both physicality and emotion. The Cabiri presents an exceptional aerial dance and music experience, complete with dessert and cocktail service. The historic storytelling and unique talent of this company are not to be missed, and the haunting tales of The Wild Hunt are a perfect launch to the fall holiday season. The Wild Hunt can be seen through November 3, 2013. Tickets are available through Brown Paper Tickets.